This is a short post just to tell you about the journey from New York City to Canada which was our next stop. We stayed the night in an Inn in Binghamton. 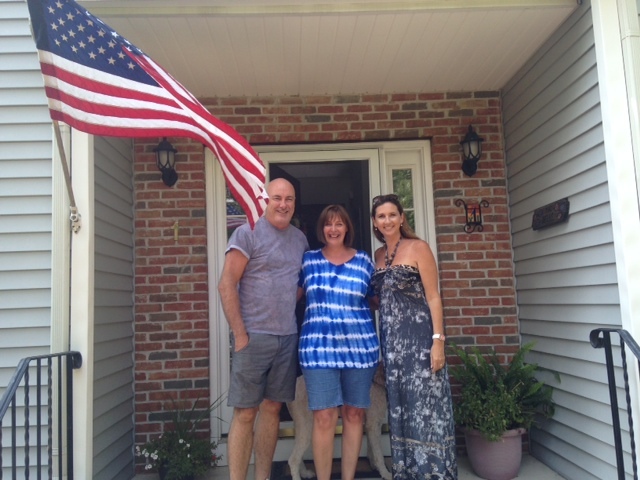 The main reason for posting is that we stopped to visit an old friend who my parents haven’t seen in 30 years. Her name is Penny (Lego) Bell and she lives in Sparta, New Jersey. Mom and Dad called back the past and chatted about their common friends like Mark and Sharon, Cathy Monteith, Graham Morris and the Minnaars. Penny made us a lovely lunch and sweet cakes – she lives in a lovely house on a hill and has a dog that is quite unique called a Labradoodle. They have bears that visit them from the woods at times! Unfortunately we were not able to meet her husband as we needed to hit the road shortly after our arrival. The drive up was very short and covered in forests, there wasn’t that much to see. For supper we went to an Applebees in Binghamton, the food was good as always. We turned in early, watched a little bit of TV and went to bed. So pleased you could still remember enough of your past to recall the good old days in PE!!!!! Hey we not that old! It was really great catching up again! Lovely post about your visit Mitch. I really enjoyed having you guys over, and wished you could have stayed overnight so I could have showed you the area a bit. 3 hrs went by in a flash and I really appreciate that you all stopped by. I’m following your journey with great interest.